Identity KAOS principles were developed to provide a road map for protecting personal information. These identity protection principles are highly important and necessary when considering the protection of an identity and a reduction of identity theft risks to an acceptable level. You should be aware that identity theft risks can never be completely eliminated and must be properly managed to reduce the risks to a level that is acceptable for each person. An "acceptable level" of risk may be different for each person and must be carefully determined to identify the level of protection and related costs. For example, you may decide not to place a fraud alert on your credit report and just monitor your credit report for suspicious and unauthorized transactions. This would be perfectly fine for as long as you accept the risk of new and unauthorized accounts opened in your name while you are satisfied with detecting potential fraud when it occurs through credit report monitoring. Knowing – in order to properly protect our identity components, we first need to know what and where they are. We all have various bank and/or online accounts, a set of credit cards, a bunch of government issued documents such as passports and birth or death certificates that we must identify and locate before we can think about protecting them. Assessing – when the list of our identity components is complete and related information is gathered, we need to analyze our protection efforts as we manage our identity through its lifecycle. We should always aim to accumulate less identity components and analyze the use of personal information to minimize the identity protection risks. We must fight identity obesity by reducing the amount of personal information while analyzing how we use each personal information in our risk assessment process. Organizing – we should attempt to organize our personal information while we observe and monitor them. Organizing personal information has many benefits. For example, we can find documents faster when needed or we can access the related information much quickly for fraud resolution. When fraud occurs, the last thing we want to do is waste time by searching for related information. Monitoring our identity in as many areas as possible is also extremely important to detect lost, stolen and abused identity components. Secure – after we organize our information, we need to secure them with care and share with caution. Securing and less frequent and unneeded sharing of personal information will reduce the risks of identity theft. 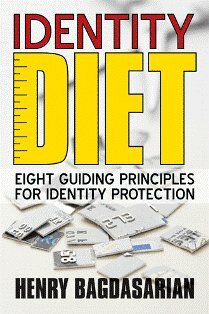 The Identity Diet program was developed using the Identity KAOS principles to help create a customized identity protection plan that is developed based on each identity’s risks in the 4 categories of the principles described above. Once we identify the unique risks of each identity, we can then create an identity protection plan in order to reduce the risks to a level that is acceptable by each identity owner. More details about the Identity KAOS principles can be found in its own section on this site.